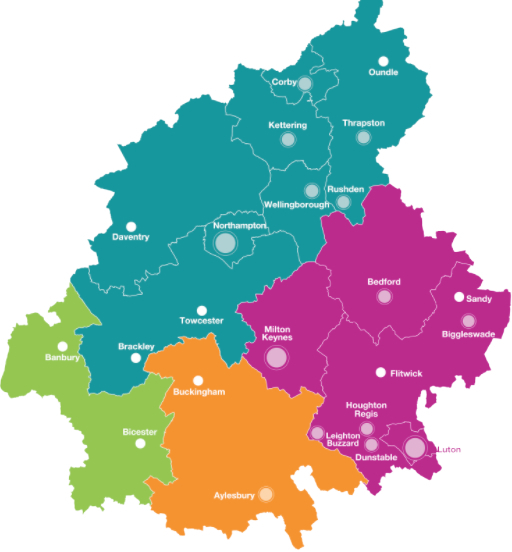 The map below shows our area’s key clusters, major businesses and assets operating in the South East Midland’s Showcase Sectors. For full details, go to the Growing Business section of the Strategic Economic Plan. We have one of the fastest growing and successful economies in the country. GVA currently stands at some £50billion, up from c.£45billion in 2010 and will continue to contribute significantly to the national economy. We have around 80,000 VAT registered businesses in the area. Today, our population is around 2 million people, growing by 16% in the five years to 2015, and is projected to grow to 2.42 million by 2039. The South East Midlands also plays an important role in providing housing for the nation. Over the 2010/11-2015/16 period, we built 50,000 new homes, accounting for 6% of the England total. Our area is home to a large number of economically important assets including the Aerospace Technology Institute at Cranfield University, the Transport Systems Catapult in Milton Keynes, Millbrook Proving Ground, the Silverstone Technology Cluster; as well as three Enterprise Zones: Aylesbury Vale EZ, Luton Airport EZ and Northampton EZ. We are also home to seven universities, including Cranfield University and The Open University, nine further education and sixth form colleges and a university technical college. The South East Midlands area is located at the core of the Oxford - Cambridge Arc, Government recognises the potential of the Arc as a strategically important area to stimulate economic growth in the national interest.